This article appears in THE Journal's July 2013 digital edition, focused entirely on preparing for the Common Core. A free video lesson tool, Knowmia Teach lets users create animated, sequentially ordered slides. According to Elizabeth Calhoon, an academic technology specialist at the Santa Clara (CA) County Office of Education, the best way to use apps for Common Core curriculum is not to look for apps aligned to specific standards but to find ones that encompass the "ideas of collaboration and creation [which] are far more pervasive in Common Core" than in the current paradigm. The following is a selection of apps for ELA and math, curated with help from Calhoon, that do just that. 1. Virtual Manipulatives allows instructors to create lessons around drag-and-drop "fraction bars" that can aid in lessons comparing fractions, decimals, and percentages. Free for iPad. 2. With ThingLink, students can curate a collection of photos and annotate them with multiple pieces of text, YouTube or personal video, or even Twitter handles. Free for iPhone or iPad. 3. Toontastic records users as they move characters around a screen and narrate their story audibly. Photos can be imported for use in backgrounds. Free for iPad. 4. 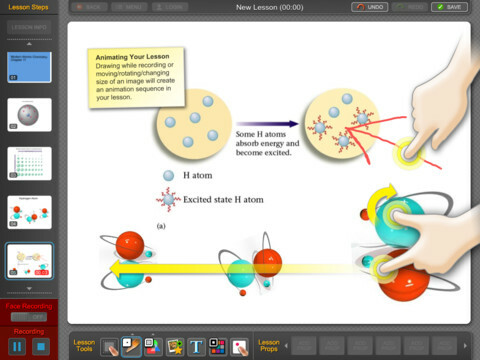 Knowmia Teach allows teachers to create short video lessons in several small steps, similar to how they might develop a slide presentation. The lessons can then be posted online. The apps records fingerstrokes and audio for later playback. Free for iPad. 5. Mindomo, a mind-mapping app, offers a real-time collaboration feature and lets users turn their maps into presentations and share them with others. Free for iPad. 6. The mobile counterpart to cloud video editor WeVideo.com, the WeVideo Uploader allows students to capture videos and photos directly on their device, import, and even begin the editing process, which can be completed online. Free for iPhone and iPad. 7. Teachers can use 3D modeling software (such as Google SketchUp) to design projects around virtual manipulatives like geometric shapes and architectural models. They can then import them into the SightSpace 3D app for mobile viewing, which can be layered over real-world environments for an augmented reality twist. There is a free version for iPhone and iPad, as well as a $39.99 version.